A student-designed, autonomous robot named Jankbot Rises walked to victory during the 23rd annual Design Competition at Northwestern. After dominating the preliminary rounds, Jankbot Rises beat out robot Skynet in a head-to-head final battle to clinch the first place $1,000 award. The competition took place on Saturday, May 17 at the Ford Motor Company Engineering Design Center. This year the popular event had a twist: no wheels. All eight competing robots were required to walk autonomously around the arena. Teams of undergraduates, representing a variety of engineering fields, spent six months designing, building, and programming their robots to operate autonomously. As in past years, remote controls were not allowed, but teams were permitted to reprogram robots as often as they desired. 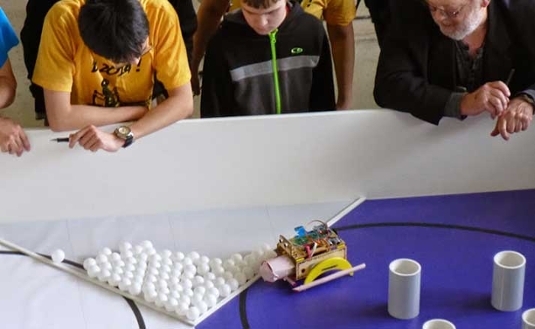 After completing a race and a maze in the preliminaries, robots in the final competition picked up Ping-Pong balls in a large rectangular arena and delivered them to a goal. Jankbot Rises picked up the most balls in the allotted time. Jankbot Rises also received the $500 Myke Minbiole Elegant Engineering Award.